New York State Legislature Passes Bill Providing 9/11 Rescuers Sick Leave. 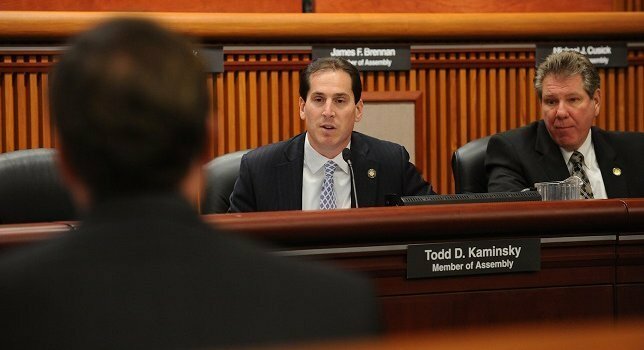 New York State Senator Todd Kaminsky. Photo by: Office of Senator Todd Kaminsky. Albany, NY - June 22, 2017 - Today, the State Senate passed legislation, championed by Senator Todd Kaminsky, granting sick leave to 9/11 first responders who contract an illness as a result of having worked in or around Ground Zero following the September 11th terrorist attacks. The measure (S.6398a) -- which applies to active police officers -- ensures these heroic individuals who worked on the rescue, recovery and cleanup of the World Trade Center Attacks are not financially penalized while seeking medical treatment by having to exhaust their personal leave time. "I'm so happy to see that Senator Golden and Senator Kaminsky were able to join forces and create a bipartisan team to take care of sick first responders. I was more nervous about this bill not passing than getting results from a PET scan I had the same day. Also, I'm very appreciative of the help from the Fealgood Foundation. John Feal and Anthony Flammia have been there through the entire fight with support," said Chris OConnor, a Detective with the Rockville Centre Police Department. Currently, the New York City Police and Fire Departments provide unlimited sick leave. However, first responders who served on September 11 and left city agencies to pursue other public service opportunities on Long Island and elsewhere are ineligible for such “line of duty” sick benefits since they are no longer employed by the City. Further, because their illnesses were contracted while employed by the City, their current municipal employer cannot treat their illness as “line of duty” either. The bill will require the state to pick up the tab for these heroic rescuers’ sick days. Healthcare coverage for conditions contracted from the effects of Ground Zero are already covered under the federal Zadroga Act. A video of Senator Kaminsky's comments from the Senate floor can be viewed here. Subject: LongIsland.com - Your Name sent you Article details of "Senator Kaminsky Fights For World Trade Center First Responders"